March | 2012 | eating with S.O.L.E. My father in law passed this delicious recipe on to me last week, and I have been eager to make it since tasting it! I made very few tweaks to the original recipe, and thought the results were delicious! After a week and a half of eating and drinking in the big city, I was over the moon to enjoy our last evening having a home cooked organic vegetarian meal at my mother in laws, complete with these beautiful kombucha cocktails! She got us on the kombucha train a couple years back, and since we have brewed and bloomed and enjoyed this belly tonic a great amount. Eventually I killed most ever mushroom I ever had, and haven’t brewed a new one for a few months. 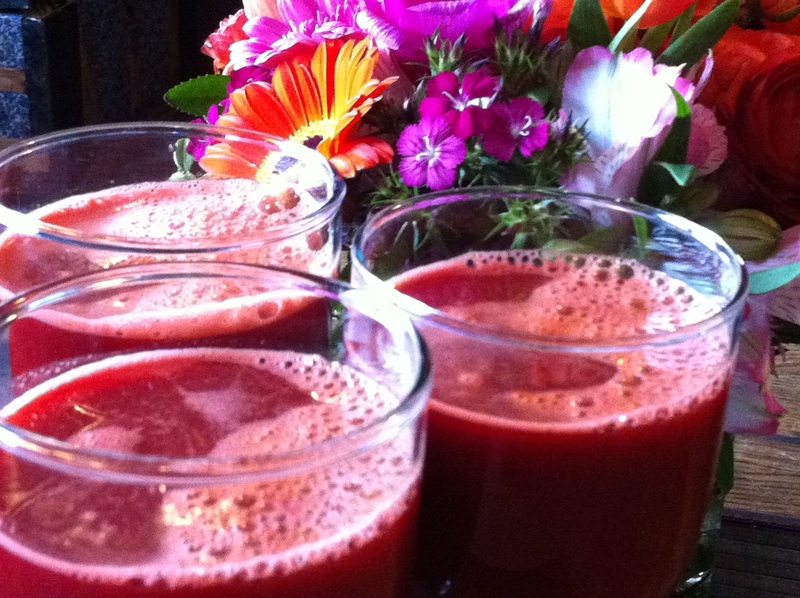 It was nice to taste her bubbly sweet tonic and the veggie juice we served it in was just what the doctor ordered. Juice and blend together and serve each portion with a 2 oz serving of kombucha for the perfect big city detox serum. I am happy to be back in paradise and thrilled to find parts of my garden unearthed from it’s heavy blanket of snow! And now that I am back in the kitchen I will get back to my regular postings. I am also happy to report that we are hosting permaculture interns (not unlike WWOOFers) from now through the harvest here on our smallholding, this means I have 20 meals a week to plan and serve to hungry workers… so I imagine you’ll find here many diverse grain salads, and hearty seasonal one pot soups / stews to carry me through the increased work load of the seasons ahead! 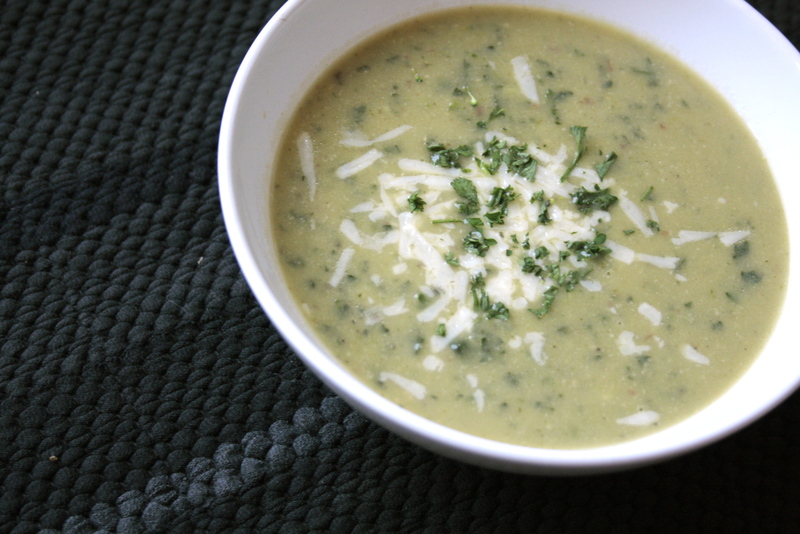 What could be more perfect for St. Paddys Day than a green bowl of beer soup? I was inspired to use some of the deep dark delicious stout we just had brewed, to create a cheese and stout soup… but I also wanted to inject a serious dose of veggies, so this soup got doused with kale and broccoli, onions, garlic and potatoes too. I used a good amount of nutritional yeast as well, which lends itself to a really cheesy flavour, with out the extra fat and expense of lots of cheese. I did however use some nice aged sharp cheddar in this dish, but didn’t feel the need to fluff it up with a mountain of cheep melting cheese (which but the way is something I am trying not to buy, and as cheese is my vice, I am weaning myself off depending on it as a go to snack). A good amount of cheese you find in grocery stores (from all the major brands) is full of very questionable ingredients… mainly modified milk ingredients which are chemically engineered dairy fats and sugar blends imported from all over the world in an attempt to side step the heavy red tape dairy quota process. Just another way for big business to over charge us for cheap unsafe food filler! If this subject interests you and you’d like to learn a little more there are two great podcasts from deconstructing dinner you should listen to! Let simmer over medium heat for about 30 minutes or until the potatoes and the broccoli stocks are fork tender. Then zip up everything with a immersion blender until silky and smooth. Garnished with fresh parsley and a sprinkle with cheese. Serve with a pint of ale and enjoy! The picture was shot on my newest hand woven rug, made from black up-cycled T shirts! I have just joined this great recipe swap blog group run by the Burwell General Store, and I am thrilled to be part of an inspired group of seasoned bloggers who are up for the monthly vintage cookbook challenge Christina dishes out. Once I joined the group and as I was eagerly awaiting my first challenge I had this creeping fear of receiving some mayo laden jellied meat recipe, seriously… when low and behold what challenge should arrive in my inbox, but a jell-o snowflake salad. Yes folks, veggies and cheese encased in jell-o served on a bed of greens with a dollop of MAYO! ACK. 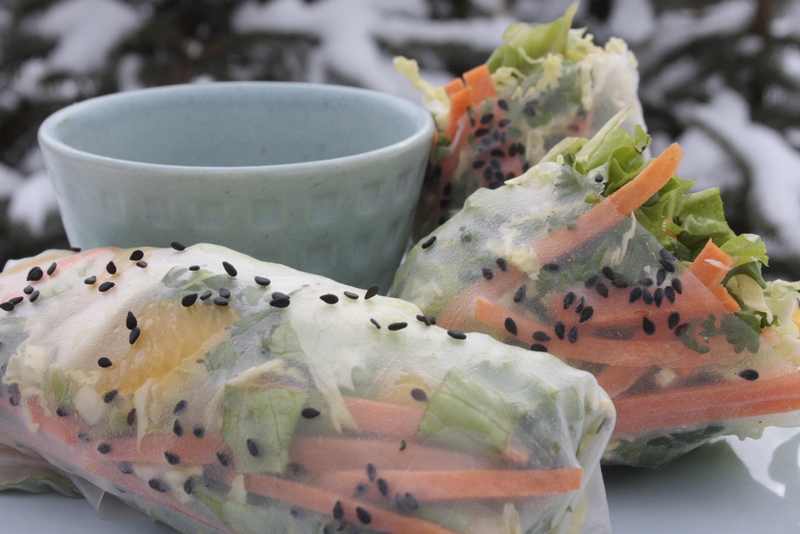 Luckily the challenge leaves room for interpretation, and I embraced the jell-o (albeit organic, vegan gluten free jello alternative) and can honestly testify that I created delicious vegan snowflake salad rolls, which totally rocked! Well here it is, the 10th annual birthday cake extravaganza for my daughter. 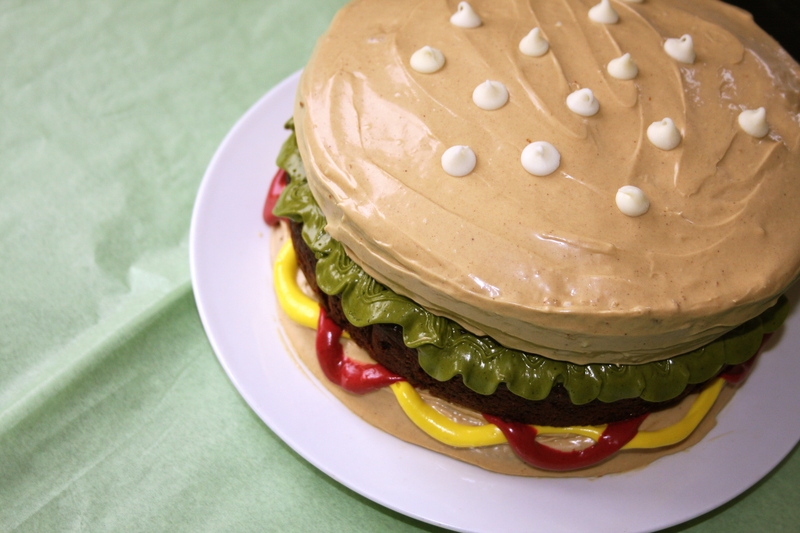 A vanilla chocolate 3 layer hamburger cake with cream cheese butter cream frosting and naturally colored condiments! The last few birthdays cakes have all had a Food theme; sushi petifores, the watermelon cake (my favorite), and the circus caramel popcorn cake! 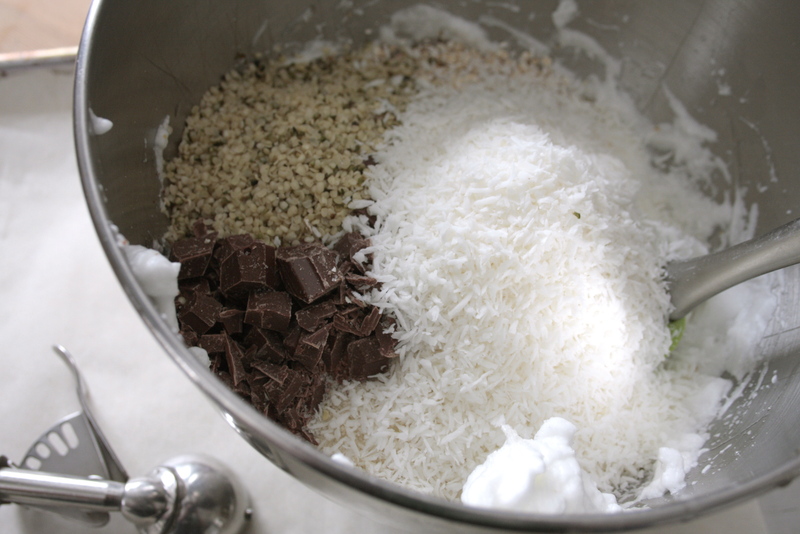 I have a confession to make… Yesterday I made boxed cake mixes, albeit organic ones! I was just too busy to bust out 2 more batches of cake from scratch, after a day of baking at the bake shack, then coming home to bake sweets for a baby blessingway, at the end of the dat I just had to call it at the triple layer cake mixing! Today’s icing adventure was time consuming enough! This cake burger called for 2 x 9” vanilla cakes and 1 extra thick 9” chocolate cake which I left un-iced, and boy does it have a serious meaty look to it! I created a hybrid butter cream – lemon cream cheese frosting, which was entirely organic and I opted to dye the different condiments using natural coloring: the lettuce was matcha, the mustard tumeric, and the ketchup beet root powder and cocoa. The bun was tinted with cocoa powder and the sesame seeds are white chocolate chips. So today I will be busy eating burgers (both meaty and cakey) and roller skating at the derby rink, with a bunch of 10 year olds girls! Curry goat is among my top 5 foods of all time, right up there next to: poutine, yorkshire pudding, sunwarmed raspberries, + roasted duck. So tonight was a real treat. 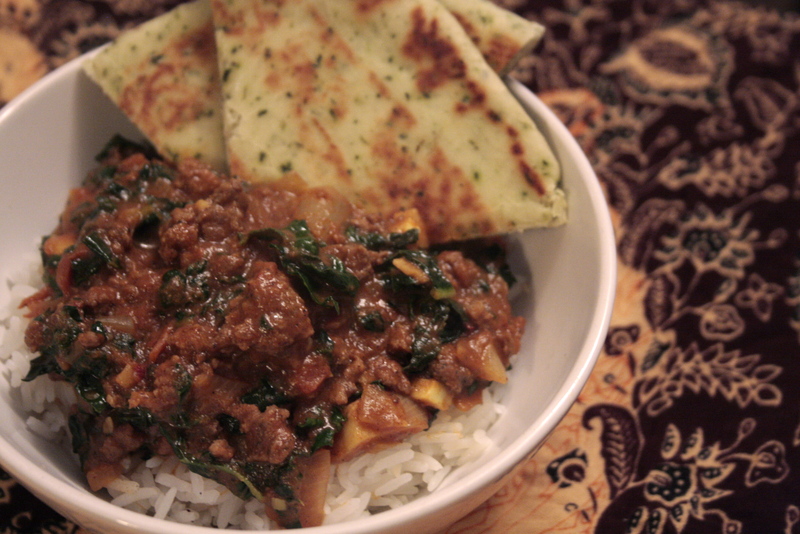 I bought some spinach naan in town today and oven warmed them to be served along with basmati rice (yes I busted out the white rice for a truly authentic Indian feast) and this rich goat gravy. The gift of goat meat came from my milkmaid back road buddy who taught me how to make cheese a while back. Not only are her little billy goats cute and sweet they are awfully tasty too, poor dears… They ooze the adorableness that makes the statement “your so cute I could eat you” really hit home! Ohh I just love when my house smells like ginger and curry and garlic and chilli… and cute billies. So to make this amazing goat palak you will need some goat (or lamb) and some garam masala, this is my favourite blend, from Chamela Giri. You will also need a pinch of patience, because as the aroma fills your house it will be hard to resist eating out of the pan as it simmers and thickens away. 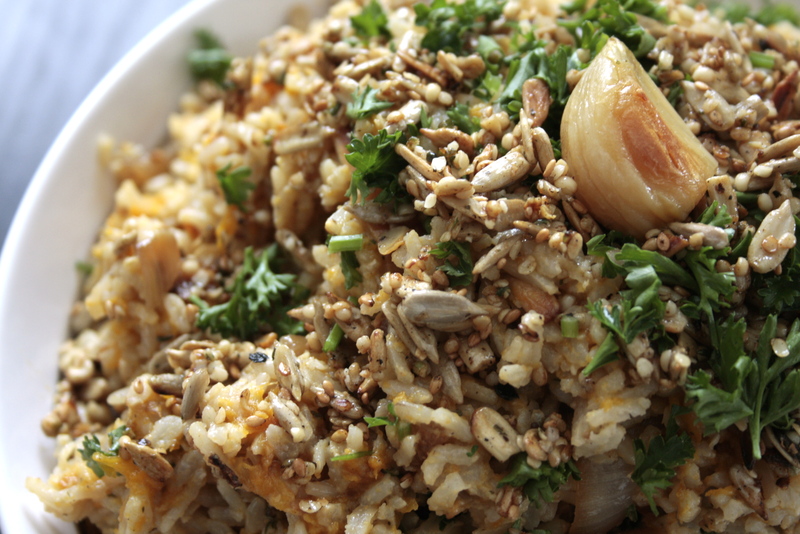 Yes indeed this is another pilaff recipe… I guess I just can’t get enough of the diversity of texture and flavour in every bite. A little soft, a little sweet, a little spicy, a little crunchy. Plus I love a simple gluten free vegan dinner that can be turned into soup on a whim! I made this squash pilaff to bring to dinner at our fabulous friends house who roasted a lovely leg of local lamb, the ideal occasion to whip up a little jar of mosquito mint sauce, for a cozy classic drizzle perfect for any roast red meat. 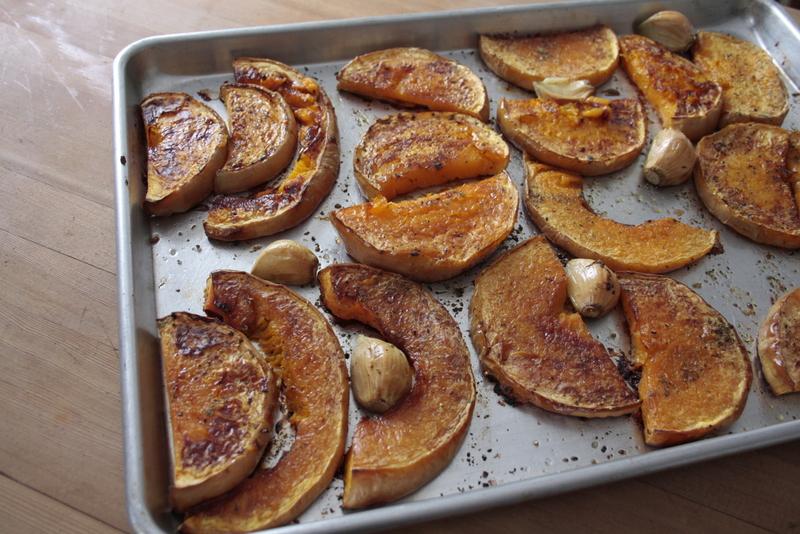 I started by oven roasting a whole bulb of garlic, sadly one of the last from my harvest, along with a butternut squash. Then I seared a pan full of onion slowly, building the rich caramel flavours, toasted a medley of seasoned sweet sesame, hemp and sunflower seeds, and all of this got tossed into a hearty bowl of brown rice coated with a hemp oil + tahini dressing. I made a simple seasoned salt which I used in all elements of this dish, so this amount will cover all the demand for “seasoned salt” in this recipe. along with a drizzle of olive oil + the above salt blend, once golden brown squeeze a drizzle of maple syrup or agave over the lot and toss frequently, remove seeds from heat, and set aside. 2 yellow onions sliced into thick 1/2″ rings with a drizzle of oil + again more of the salt blend. de-glaze then pan with white wine or water once the onion is nicely browned then allow the onions to soak back up all the rich juice, set aside. 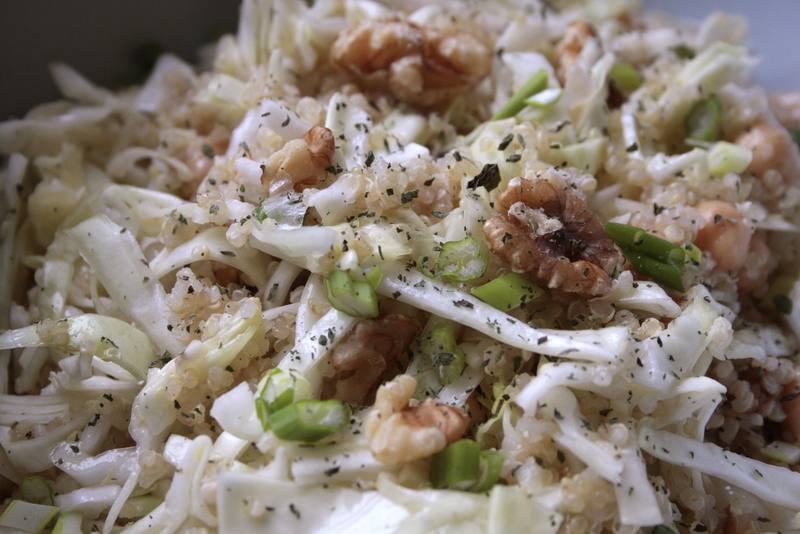 Finally chop up all the squash, garlic, and onions, toss in the nuts and mix gently into the dressed rice. serve warm garnish with parsley. It all reads a bit fussy, but it’s a nice cooking process that you can do leisurely, and ahead of time. 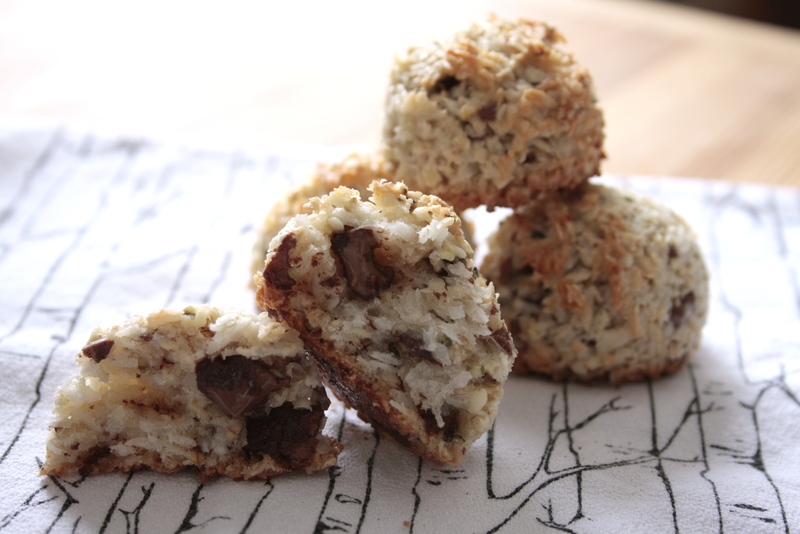 This is a super quick and easy one bowl recipe for little luscious macaroons packed full of oats, chocolate, hemp seeds and of course coconut! gluten free and lactose free, low-ish in sugar but high in deliciousness! They take all of 6 minutes to get in the oven and worth every second of effort! Gently combine, and portion into small balls on a parchment lined pan, bake at 350 for 15-18 minutes, or until nicely toasted.